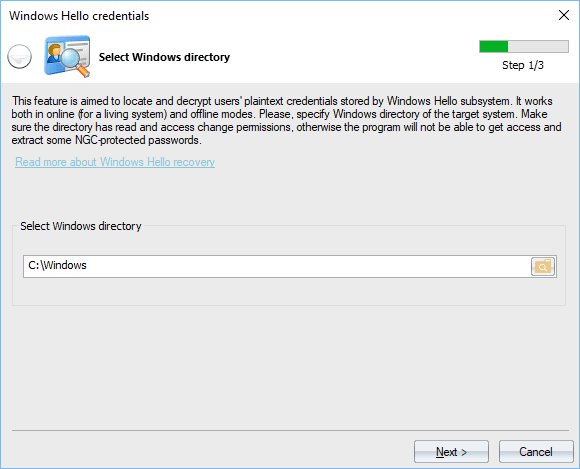 This feature is aimed to locate and decrypt plaintext credentials stored by Windows Hello. 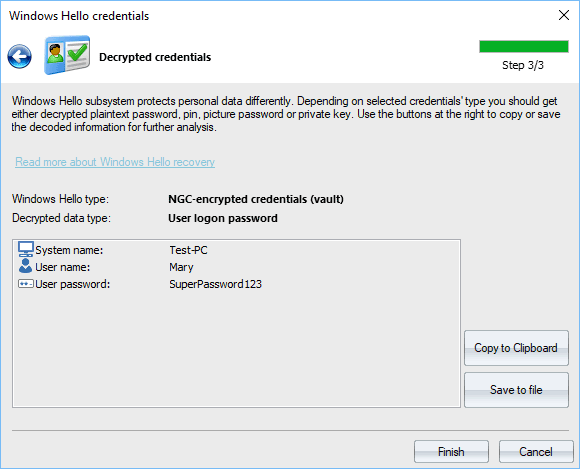 Windows hello uses Next Generation Cryptography (NGC or also called CNG) to protect and store user private data and encryption keys. Even though NGC is very elaborated and sophisticated system (worth mentioning that it uses even some undocumented trick to protect encryption keys and data), Passcape software was first, just like in case of DPAPI, who managed to create the almost identical set of APIs but with support for offline mode. Yes, the tool can be used both for a living system and for any external OS. That makes it easy to work with the program even for a newbie, leaving all the numerous and routine operations to the program. The working mode is detected automatically once a Windows directory is set. 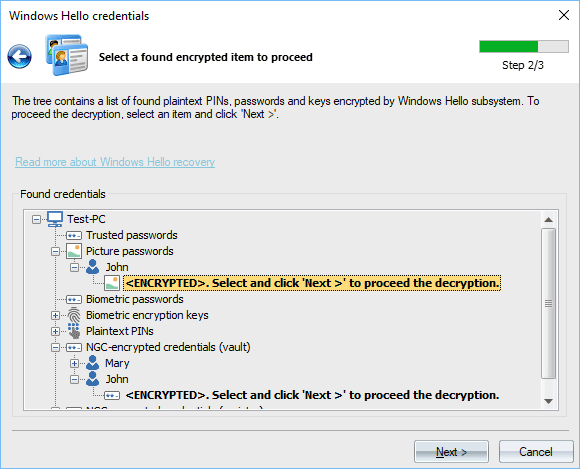 The Windows folder holds files and encryption keys protected from being accessed to even by Administrators. To extract the keys, this folder should permit access change or file write operations. Otherwise, the program will not be able to decrypt passwords encrypted with NGC. To finalize the decryption, just double-click an item in bold. Decrypted logon password (hidden here) and picture password. Your picture password is poorly protected and can be easily decrypted and viewed by anyone who has physical access to your PC. Avoid using it on Windows 8-10 systems. Decrypted logon password and PIN code. 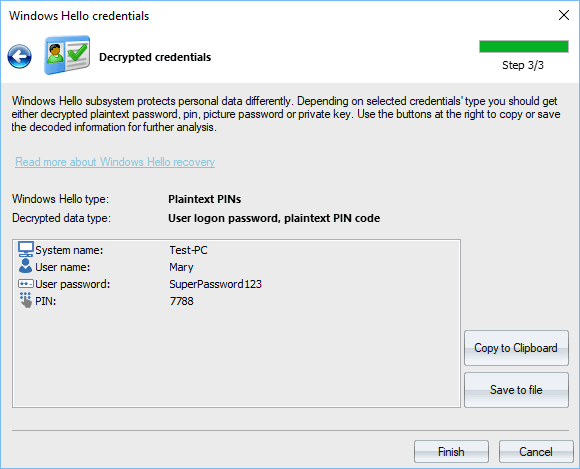 Starting with Windows 10, the PIN is no longer saved as a plaintext. However, it can be instantly recovered to plaintext in Windows 8. Decrypted logon password for user 'Mary'. Note that plaintext passwords protected with NGC can be decrypted using either a biometric key or a PIN. 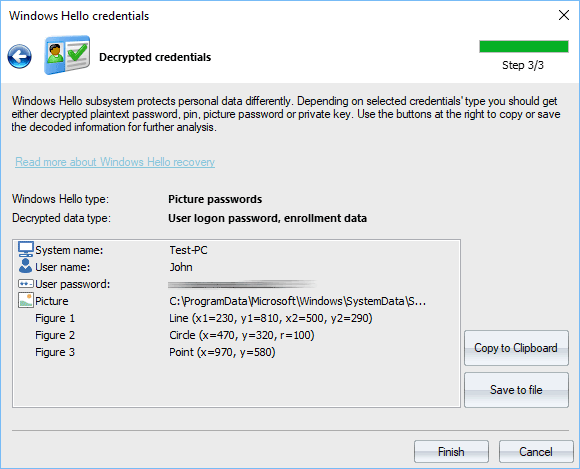 The program first tries to locate biometric keys and if it fails to (for example, the biometric logon has not been set), Windows Password Recovery prompts for a PIN in order to be able to finalize the decryption.